Spring is in the air, and for High School students nationwide, that means one thing – prom season is approaching. As teens gear up for a night out on the town, girls and guys alike are scrambling to find the perfect ensemble. 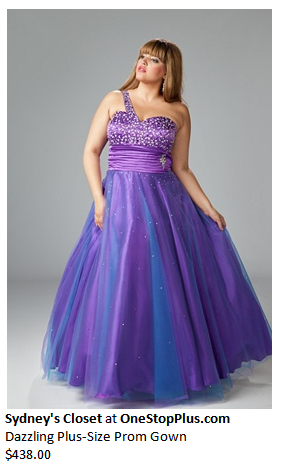 But, for plus-size girls with limited formal wear options, finding that one special dress may be especially difficult. Preparing for this rite of passage shouldn't be a complicated task but a fun and memorable occasion, which is why OneStopPlus.com®, the world's first online shopping mall for full-figured women, is hosting its first-ever Plus-Size Prom Makeover. From March 27, 2012 through April 21, 2012, OneStopPlus.com® is inviting plus-size teens who are struggling to find the perfect prom dress to share their personal stories via Facebook and/or ospeditor@onestopplus.com for the chance to win full makeovers for their proms. Family and friends are also encouraged to submit entries on the teen's behalf. Two lucky winners will receive the prom dress of their dreams, hair and makeup treatments, limousine transportation to the prom venue and a $500 shopping spree, all courtesy of OneStopPlus.com®. They can provide styling tips for plus-size teens seeking to achieve the most flattering and beautiful prom looks.